To develop and test new aircraft and weapons systems is the mission of the U.S. Air Force's test centers. Featured on the DVD are three rare, historic films. 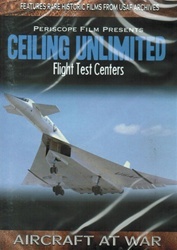 Ceiling Unlimited describes the feverish R&D efforts undertaken at Wright Field during WWII. Planes and pilots went higher, flew faster and farther thanks to research at Wright. The story of Edwards Air Force Base, the famous desert proving ground of the X-Planes, is recounted in Beyond the Horizon. The film traces the expansion of Edwards from a primitive bombing range to the world's premiere flight test facility. 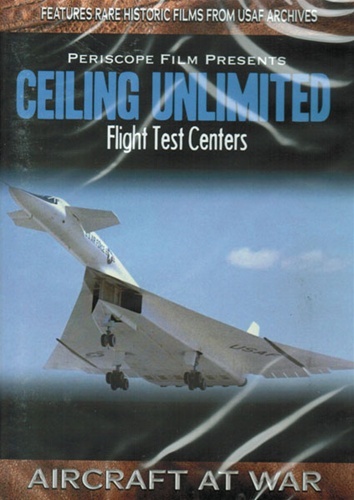 Finally, the DVD includes The XB-70 Story. This extremely rare film profiles the Mach 3.0 capable, Valkerie nuclear bomber. Following a disastrous 1966 mid-air collision involving one of the two XB-70 prototypes, the program was curtailed and the film shelved, never to be seen again - until now! Digitally remastered and restored from original 16mm prints. Due to age and rarity of these films, image and sound quality may vary. Run time is about 86 minutes in B+W and color. Format is NTSC DVD and region-free.